Drawing from her own experiences, and the wisdom of her teaching experiences with many others, Ms. Sara Wiseman crafted an eloquent description of a life cycle from a spiritual perspective with her book Living a Life of Gratitude: Your Journey to Grace, Joy and Healing. I had the pleasure of conversing with her on the subject of her awakening, her teachings, and the subtle ways we are part of a beautiful, spiritual community that is rarely seen but often felt. She has an innate care and elegance of expression that reflects her work. Q: Your training, podcasts, and series of mini e-books (Soul Immersion Mini Series) seem geared to help people achieve their own spiritual awakening. What was the moment of your awakening? A: In 2000, I had a near death experience, and that was when my life began to shift; in that experience, I saw, knew and understood God/Universe/Divine/All at a level I can’t explain; it was transcendent. That understanding changed me—it made it impossible to go back to how I had been living before. From that opening, I started to have a series of other experiences: and in 2008, it was sort of like the floodgates opened, and I received The 33 Lessons, spiritual teachings which became part of my first book. I find the opening continues—every moment is an amazing experience! Q: Wow! How did you come to discover your intuitive abilities? A: I believe that if you walk along the spiritual path long enough, you can’t help but become intuitive; and if you walk along the intuitive path long enough, you can’t help but become spiritual! When we understand Oneness—that we are One and all is One, and that there is literally no separation—then intuition is a given. Q: That’s a fascinating concept; but sometimes it can be draining to connect to others on that level, where there is no separation. What was your process for handling that? A: I have a lot of compassion and feeling for others—I want everyone to be happy! So I do get sensitive when things aren’t going well for them. That said, it’s not my job or place to fix someone—I’m there as conduit for the Divine. So I work on being fully present when I am with someone, and then when that is complete, letting it go. I don’t have any formal process for releasing energy, as some do. I do limit how many sessions I do per week; that really helps. Q: Good advice, thank you! What led you to offer the DailyOM distance learning courses? A: I am so impressed with DailyOM’s vision of offering high-quality, distance learning courses at a sliding rate! It’s very important to me, that everyone has access. Especially people in other countries, where the exchange rates are different and it can be hard to afford things like courses. That’s one reason I do so many free podcasts for my radio show—so that anyone can have access to the information, regardless of income. Q: That’s cool to be so conscientious of the international (and, in some places, national) economic marketplace. Among your services, you offer intuitive readings and clarity coaching intensives. What is your greatest challenge when it comes to connecting with people in this way? A: The people who show up to me are such amazing human beings—they are my teachers, as much as anything I can offer to them! My challenge is to set myself aside and be fully present—and then let the guides show me what to notice, say or illuminate. I find it very enjoyable to work with people at that level of consciousness; it’s a very high vibration that we share when we are in session, and it’s wonderful. Q: Sounds amazing! 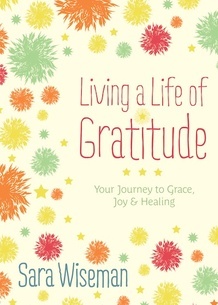 You have authored six books, including Living a Life of Gratitude: Your Journey to Grace, Joy and Healing. You move through Birth, Emergence, Connection, Love, Convergence, Expansion, Nature, Awareness, Awakening, Presence, Transition and then you return to Birth. What does this circle represent? A: There’s a commonality to the life experiences we share as humans—we’re on the journey of soul growth, which is about awakening and opening to an unlimited degree. Each of us has access to this kind of progressive awakening as we move through the container of this lifetime. For example: Connection. At some point in your life, you’re going to experience a profound, real, heart-opening connection to another person. This is a passage of soul growth. Q: Yes, and another example you include is “Nature”. In your blog post, “October is for Respite, Retreat, Hermitage, Healing” (http://www.sarawiseman.com/3/post/2013/10/october-is-for-respite-retreat-hermitage-healing.html) you share some things we may expect to discover in this month. How does nature affect us? A: Nature has consciousness, just like we do; it’s just at a different frequency or vibration. When we listen or notice nature—watch leaves moving, or really feel the wind blowing, or have an emotional response to the crash of waves—we shift into that frequency. This is a layer or level where it’s very common to have instantaneous opening, bliss, awareness, messages, visions and more. And, you don’t need to be on a nature trek; you can just spend some very simple time meditating on a flower, or walking in the park. Q: I could reconnect to those sensations just with the reminder. You deal with so many things that might be hard to express, but you capture them beautifully. What is your writing routine? A: When I’m writing a book or course, I really focus—I’ll write daily for hours. But when I’m between projects, I do other things—I like to just be in life. I do use a journal continually, to work out ideas that arrive to me from dreams, meditation, nature, all kinds of sources. I write at home, in the mornings, in a tiny little office filled with Buddha statutes and books. Q: Cool! How have you cultivated balance? A: I don’t think I have cultivated balance! It is such a life dream, to be able to do this work; I’m so passionate about this field of spiritual intuition! I work very hard, and I have the ability to focus very clearly—but when I need a break I take one. I like very simple things, like walking in nature, or eating, or watching a comedy; just easy things. Q: That’s neat that you’ve got something fluid that matches life. Is there anything else you would like to say? A: I find the challenge of life is very interesting. On the one hand we’re Divine beings; on the other, we’re so very human. The day I have the most extreme bliss experiences might also be the day I snap at a family member—it’s all happening at once. We’re both completely perfect, and totally flawed, and that’s what it means to be a soul in a human container—we’re all of everything. For more information, please visit her website at http://www.sarawiseman.com/. Reviews of her work can be found at Amazon on http://www.amazon.com/gp/product/0738737534).